All $4 packs now 5 for $15 and $62 for a 24-pack Box. All $2 packs now 6 for $10; and $42 for a 30-pack Box. All $12 Decks now 2 for $20; $15 Deck now 2 for $25. This Sales is One-Day ONLY --- Friday, 11/23/12. A 2012 Topps Chrome Football group break* will be held here at Galaxy on Saturday, 11/10/12 at 2 p.m. (scheduled release date of Topps Chrome is Friday, 11/09/12). been taken and will be $37.50 per spot. All the cards from a 12-box HOBBY case that match your randomly assigned team will belong to you. You may purchase one spot or many. Call us at 630-637-0187 to reserve your spot before they fill up! w that Topps Chrome is synonymous with…THE AUTOGRAPHED ROOKIE CARD. Whether it’s the 2011 Cam Newton, 2005 Aaron Rodgers, 2010 Sam Bradford or 2009 Matthew Stafford, Topps Chrome has become the product to find the most collectible autographed rookie cards from the gridiron. 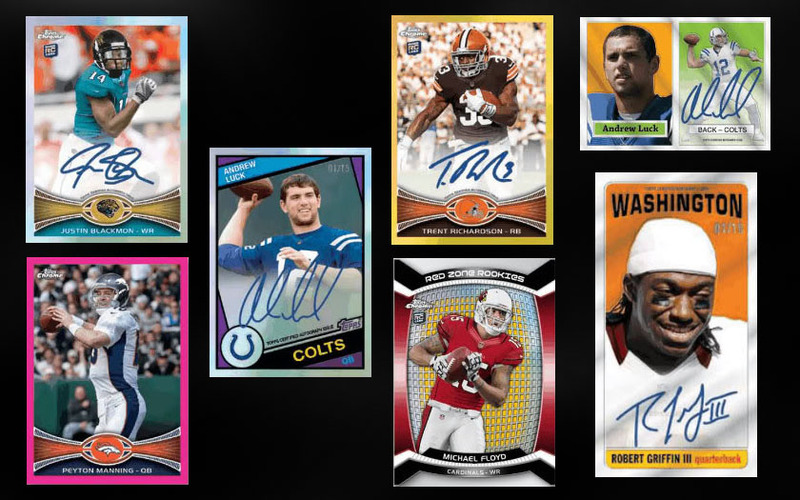 And in a year with so many hot rookies like Andrew Luck, RG3, Russell Wilson, Doug Martin and more, packs of 2012 Topps Chrome are set to be ripped in epic proportions. 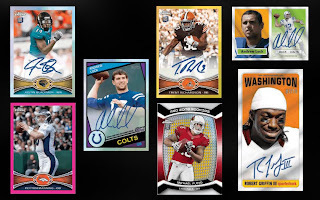 Not only will collectors be breaking Topps Chrome football for that “One Autograph Per Box” guarantee, but they will be chasing the highly sought after Autographed Chrome Parallels as well. Chrome returns with the collector favorite autographed parallels and adds 2 new ones sure to be instant classics…The Military Refractor and the BCA Refractor. Topps Chrome Football is just 1 day away. Stay tuned as we plan to bring you more exciting information leading up to the launch of this shining release!" * If and when resources are available, the whole proceeding will be recorded and uploaded to YouTube.